I've got a problem, albeit, it's not a bad problem to have. But with the recent upgrades to the family room, it has now presented us with a new problem and that is the slight lack of seating. We could get on fine with what we have, but I wouldn't want to have half of my guests sitting on the rug for an extended period of time. So, the question now is do we get a new sectional sofa (with chaise) OR do we just get a new comfy chair to go adjacent to the current sofa? Well, the problem isn't deciding between the two because I am fine with either one. The problem lies in deciding what chair to get OR what sectional sofa to get because there are so many choices out there making it hard to pick just one! Since I'm not very good at multitasking (most of the time anyways), I can only put my efforts into finding one type of item at a time. At least when it comes to something I am not 100% sure I know what I want. Which is why I am only hunting out the chair choices for now. Once I find the chair I like I will hunt for the sectional and then my husband and I can battle out which one should go in the room. Sounds like a good plan, no? I'll let you know how it ends but in the meantime check out what I've found so far. 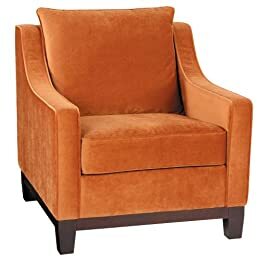 Serena Mineral Accent Chair at Overstock.com for $1,299.99. Yes, the price on this chair is a bit high but the shape is more along the lines of what I am looking for in my family room. The space in the room for the chair is not very large, so I need to be mindful of the dimensions and this one fits the bill! One thing I should mention, which might help you better understand exactly what the heck I am looking for is, this chair needs to be comfy yet small. Sounds a bit contradictory but that's what it needs to be. It's going to go in our tv room so it needs to be a great place for tv/movie watching. So, if the chairs that I am showing you seem a bit on the smaller side, now you know why. Oasis Chair at Crate and Barrel.com for $1,199.00. This is definitely at the top of my list for being one of the most comfy looking chairs I've seen! The exposed edges give it that shabby chic casual vibe that would be perfect for the family room. It looks like you could just sink into it and never want to get up. That's what I'm talking about! 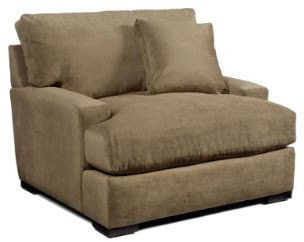 Carmel Chair and a Half at Crate and Barrel.com for $1,299.00. Okay, okay I know. This one is just a tad too big and you're right but I couldn't help but post it up because it just looks absolutely comfortable. Lounge Chair and a Half at Crate and Barrel.com for $1,299.00. Anything with "Chair and a Half" is going to be too large for this space but hey I really like this one! And you will too. Go sit in it at Crate and Barrel and you'll know why I just had to post it up regardless of me getting it or not. Regent Chair at Target.com for $499.99. Going in a slightly different direction is this Regency style chair with it's velvet-like fabric. 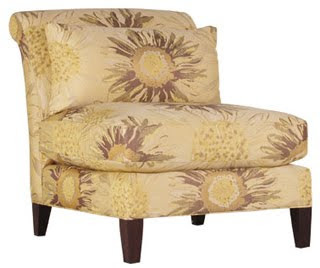 Devin Sunflower Chair at Arhaus Furniture for $699.00. 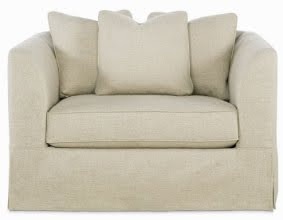 Armless chairs are another great option since you can find them in a bunch of different sizes. 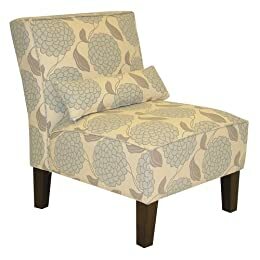 Bloom Floral Upholstered Chair-Mirage Gray at Target.com for $299.99. Another armless chair but a little smaller this time around. Might be a bit too formal for the tv room but a great chair at a great price! This chair comes in lots of different fabrics, so go check it out to find the one that's right for you! 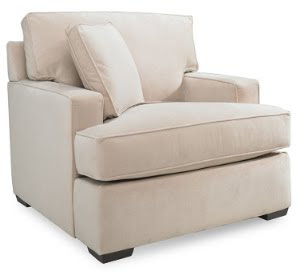 Baldwin Club Chair at Ballard Designs from $621.00 - $1,073.00. A classic design that will never fail. Sasha Chair at Macy's for $899.00. Hogan Chair at Macy's for $549.00. Tyler Velvet Matching Chair at Macy's for $599.00. Macy's got some really comfy looking chairs, don't they? Well, I've got a bit of narrowing down to do as you can see. Lots to choose from and I like them all! If you guys have any suggestions, feel free to leave comments. I check them frequently so don't think that they'll go unnoticed.